Authors Michael Shank and Casey Harrity published a policy brief this month as part of FCNL's "Shared Security" series. For the full 20-page "Security in Yemen" report, click here. Below is the executive summary excerpted from the report. Yemen is on the brink of slipping back into chaos. Outcomes from the National Dialogue Conference, which concluded in January 2014, have been slowly and inadequately implemented. Grievances among minority groups and non-state actors are growing. The economy of Yemen is in tatters; the country does not have enough food to feed its starving population; health outcomes are lagging; environmental degradation is impacting thousands; the political transition is in peril; and violent conflicts are raging across the country. An offensive campaign against al Qaeda, riots and protests in the capital, fears of a coup against the transitional government and a dramatically under-funded humanitarian crisis have all been making international headlines. But these individual events cannot be addressed in silos. Indeed, the myriad challenges facing Yemenis and their transitional government must be addressed holistically with clear goals and a clear overarching, multi-year strategy to attain these goals. There is an urgent need to reprioritize U.S. foreign policy to address the complex nature of the Yemen crisis. The current financial and rhetorical focus on targeted drone strikes risks the security and well-being of United States citizens, of Yemenis, and of neighboring countries throughout the Middle East. The United States is applying a one-size-fits-all model of targeted strikes -- based on models and experiences from Somalia and Pakistan. But this strategy is failing in Yemen. The United States needs to fully implement a more ethical and effective foreign policy; one that addresses the root causes of conflict and insurgency across Yemen. If Congress is serious about tackling violence in Yemen, no amount of drone strikes will help. The need for a shift in focus is more vital than ever. As conflict rages across the Middle East, and with new focus on Iraq and Syria, the United States must not lose focus on Yemen or allow the country to become a haven for radical groups. The implementation of the United States' current strategy focuses on short-term goals but jeopardizes long-term foreign policy and national security goals. The United States must adopt a broader and more holistic approach that emphasizes the underlying economic and political problems. This will better serve the stability of Yemen and, accordingly, our shared security interests. The only way forward is the road less traveled, and less funded -- that of long-term, sustainable, development-oriented solutions. The security of Yemen, of the region and of the United States depends on it. The United States' current strategy in Yemen focuses heavily on security through the singular lens of counterterrorism. But terrorism in Yemen cannot be wiped out without addressing challenges that go far beyond this immediate threat. The concept of "security" in Yemen extends to a series of threats that affect the daily well-being of citizens. 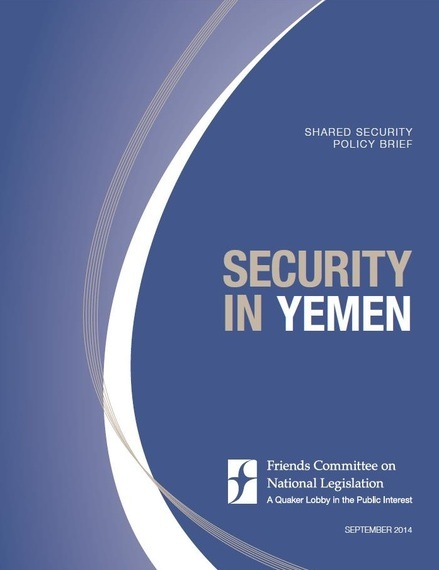 Broadly, "security" in the Yemen context can be categorized into five areas: economic security, health and food security, environmental security, political security, and security from conflict and violence. Looking at security through this broader lens allows for an analysis that includes traditional concepts of security as well as non-traditional threats to an individual citizen's well-being. It is only through understanding the causes, as well as the impact and intersection of these areas of security, that the United States will be able to implement a holistic, comprehensive and more strategic policy for Yemen. Addressing root causes of inequality, inequity and injustice and promoting the well-being of Yemeni citizens will ensure that the country thrives in the long-term. Only through addressing these root causes will Yemen cease to be a safe haven for extremist groups seeking to destabilize the region and threaten the security of the United States and its interests. Michael Shank, Ph.D. (@Michael_Shank), is the associate director for legislative affairs the Friends Committee on National Legislation, adjunct faculty at George Mason University's School for Conflict Analysis and Resolution, and senior fellow at the JustJobs Network. Casey Harrity is a Washington, D.C.-based independent consultant specializing in conflict, stabilization and humanitarian assistance policies and programs.